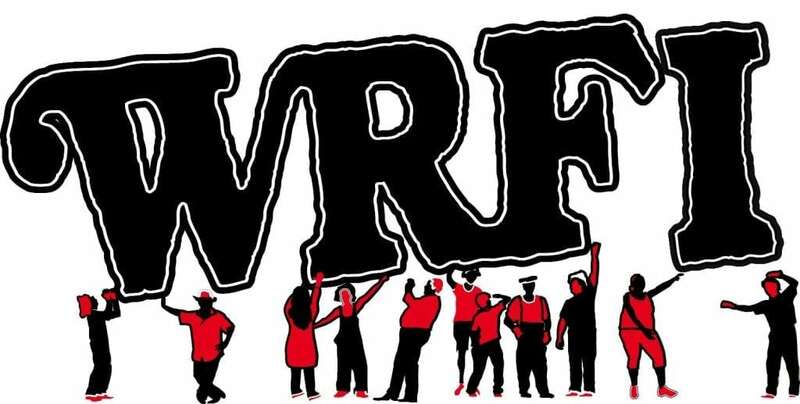 This is Part 2 of Feeding Tompkins, an in-depth look at food insecurity in Tompkins County and a collaborative project between the Ithaca College Park Scholar Program, WRFI News, The Ithaca Voice, and Hot Potato Press. This article was written by Jolene Almendarez, of The Ithaca Voice. Alison Fromme, of Hot Potato Press, also contributed to reporting. ITHACA, N.Y. — More than 1,500 seniors in Tompkins County will not eat two balanced meals today and relatives, if they have any, might have no clue that their elderly family members are going hungry. 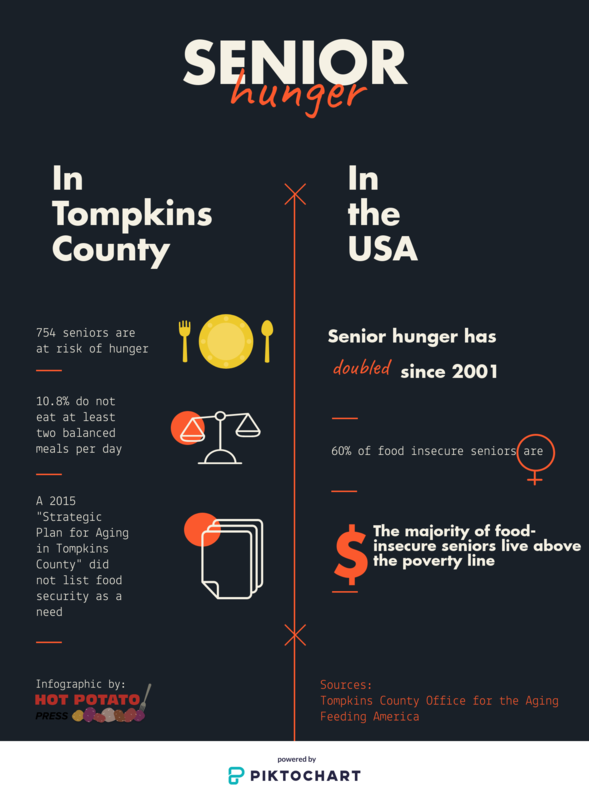 All the changes that come with getting older — health problems, reduction in income, mobility and transportation issues — contribute to more than 700 elderly people in Tompkins County being perpetually at risk of hunger. Arthritic hands unable to open packages, being unable to to cook or carry food easily using a walker, and cognitive decline that causes people to “forget” to eat are all issues that elderly people face. 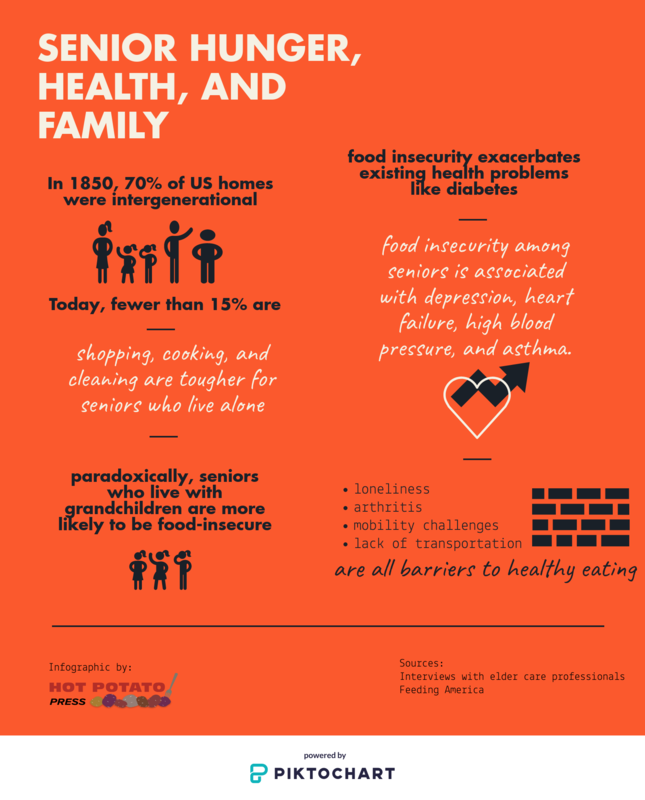 In the United States, the number of seniors suffering from food insecurity has doubled since 2001 with more than 5.4 million food insecure seniors in the country as of 2015, according to Feeding America, a nonprofit organization that researches food insecurity and helps connect people to services. This is, in part, because of a simple reason: people aren’t living with their elderly relatives the way previous generations have. Only 15 percent of homes in the United States are intergenerational. In 1850, about 70 percent of homes included an older relative. This means that caring for older people has fallen to professionals who, despite providing necessary services, are often not with seniors they care for 24 hours a day. For instance, Jessica Gosa, executive director of Foodnet Meals on Wheels, described a scenario where a person delivering food found a person’s door locked and looked inside to find a woman who’d fallen to the ground. The driver stayed with the woman until paramedics arrived and transported her to the hospital. She died a week later, but Gosa said that reminding the woman she wasn’t alone and that someone would be looking in on her with a freshly made meal is part of what Meals on Wheels does. “Human connection is as important as the meal,” she said. Meals on Wheels is one of the major programs that provides nutritious food to seniors in the county, delivering 700 meals to 400 people every day along nine routes. Of the home deliveries, Gosa said the service is “more than a meal” — it’s a friendly visit and safety check, the latter of which is preventative care that helps reduce hospitalizations. For instance, falls cost municipalities throughout the country $31 billion per year. When a meal is delivered, the driver might notice a throw rug that might need straightening or that the heat has gone out. In total, Gosa said the cost of providing a year’s worth of Meals on Wheels deliveries for a person is about the same cost as one day in a hospital. Meals of Wheels also provides Congregate Meals to the YMCA, Lifelong, Groton Center Village Court and Titus Towers, where seniors come together and share meals with each other five days a week. Community is important for seniors, especially those whose family or friends no longer live close by. At Loaves & Fishes, people line up outside the kitchen doors beginning about 30 minutes before meals are served. People from all walks of life — young children, seniors, people with disability, and people who can’t make ends meet crowd the dining room at St John’s Episcopal Church, located at 210 N. Cayuga St.
Loaves & Fishes, the only community kitchen in the county that provides hot, home-cooked meals for people five days a week, is also a source of fellowship for people who are food insecure. At a dining hall at 210 North Cayuga Street, the organization has done just that for 34 years. Every weekday, 25 to 30 volunteers work for about five and a half hours to ensure that an average of 140 hot, homemade, nutritious meals are served to people from every walk of life looking to eat. Culver said the kitchen is committed to having fresh salad, fruit, vegetables and delicious meals for people and they do so with donations from local businesses, farms and community members. 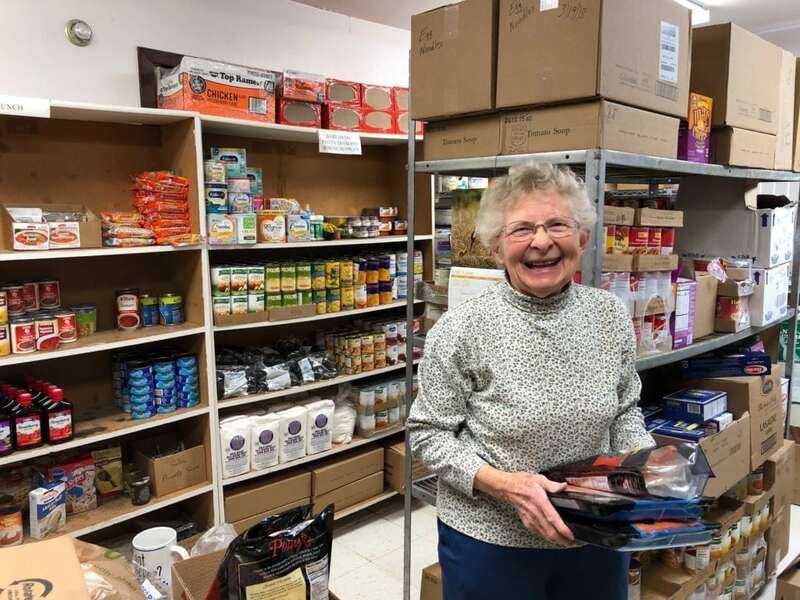 Last year, Loaves & Fishes received $40,000 worth of food donations which goes a long way toward helping the organization provide meals for people, a different and essential service than what people get at food pantries. Pantries primarily focus on providing kitchen staples for people to cook or prepare meals with. People with disabilities may not be able to cook, elderly people may not be able to navigate their kitchen well with a walker, a person with addiction might not have the wherewithal to prepare meals for themselves or their families. But Culver said it’s also important to note that many people who come to the kitchen work, sometimes at two or three jobs, are still unable to make ends meet. Culver said there was one person who was eating meals at Loaves & Fishes who was working 40 hours a week, living in a storage unit and waiting to be accepted into local affordable housing. An advocate at Loaves and Fishes, she said, was able to help them get their application for housing fast-tracked due to their homelessness. Volunteer advocates at the kitchen help connect people to services for housing, medical services, domestic abuse, and many other needs locally. “… the community really benefits from feeling like they’re part of a meaningful community that make a big difference,” Culver said. That fellowship is part of what bring 80-year-old Ron Shewchuk to Loaves & Fishes five days a week. On Thursday evening, he sat talking with friends in the busy dining area at the church and enjoying pasta. “It’s A1 food and and the company is very good,” he said. Shewchuk said he was a professor who taught material science at Cornell University from 1965 to 2000. Online records from the Cornell University directory indicate that Shewchuk did retire from the university in 2000. He said he started going to Loaves & Fishes in 2009 after an online herbal remedy business he was running went out of business. The hit to his finances combined with the fact that he never was much of a talented cook is how he ended up going to the kitchen and using the Baptized Church Food Pantry. At home, he said he mostly cooks “plain food” like pancakes and eggs. Loaves & Fishes is where he gets his hot meals from. “They have everything here,” he said, noting that the kitchen also accommodates his dietary needs with vegetarian options. His favorite is the black bean vegetarian burger. Shewchuk owns a home in the Town of Ithaca and is close to others in the congregation at the St. Luke Lutheran Church at 109 Oak Avenue. He also has a son and four grandchildren who live in Florida and a few relatives in Canada. But for him, moving to be closer to people who could help him more is not something he’s willing to consider right now. “Ithaca is my home,” he said.